Here’s the perfect way to have the pure feel of untamed bliss while blasting away in comfort and speed. The 458 spider comes with a truly freeing retractable hard-top while delivering a superb engine performance. Never again do you have to feel suffocated and restrained as the car encourages you to let it all out and enjoy the scenery without the restrictions of a glass in between. From the buildings quickly rushing by as you go, to the trees and the wind, it lets you experience the passion and scent of the world first hand! The car is definitely a remarkable union between design, technology and beauty as it is perfect for driving and even bringing a companion along. Specifically designed for luxury and remarkable performance, this impressive machine allows you hit the road in style and makes you the object of attraction of every other driver on the road. Now, balmy nights and sunny days are no longer the thing of dreams, as you can experience this from the comfort of the car you drive! Its 570 horsepower brings forth the right notes and makes for the perfect rhythm and mechanical music that awakens you and soothes your soul. Hitting 0-60mph in under 3 seconds, you can immediately tell that the 458 spider is not all talk either. It brings you a top speed of 199 mph and a 398 lb ft maximum torque that generates as much drive as it does excitement. 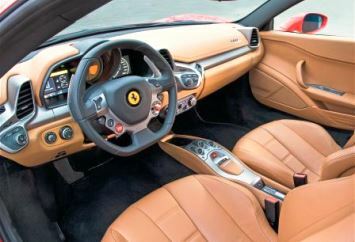 If you have never been inside a Ferrari before, then this car would definitely show you all you have been missing.